1 of 5 In a large measuring cup, combine broth with 1 cup water. Set aside. 2 of 5 Heat oil in a large pot over medium heat; add onion and cook for 3 minutes, stirring occasionally. Add crumbled sausage and mushrooms and cook for 5 minutes, stirring occasionally. Stir in rice and cook for 1 minute; add wine and cook 1 minute until liquid evaporates. 3 of 5 Add 1/2 cup of the broth-water mixture. Stir frequently and when broth is almost absorbed add another 1/2 cup. Continue adding broth-water mixture in 1/2-cup increments, stirring until rice is tender, about 28 minutes. 4 of 5 Stir in crushed tomatoes and black pepper. Gradually wilt in spinach. 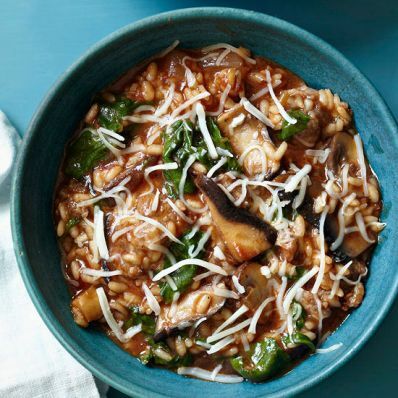 5 of 5 Remove risotto from heat and stir in cheese. Spoon into a large warm bowl and serve immediately. Garnish with additional cheese, if desired. Per Serving: 996 mg sodium, 22 g pro., 545 kcal cal., 8 g sat. fat, 5 g fiber, 36 mg chol., 22 g Fat, total, 65 g carb.